YES! I’m all set for koninginnedag! It’s my favorite holiday. Thanks. I was happy with how it turned out. 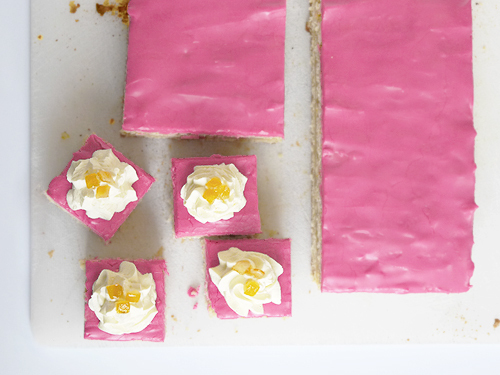 The colour of the icing in particular – I’ve come over to thinking that brighter is actually better. yummy… so colorful and beautiful. I love the photos too! Thanks! The colour was a bit alarming at first, but on reflection, I think the bright pink works better. Also amazing that it’s natural, don’t you think? 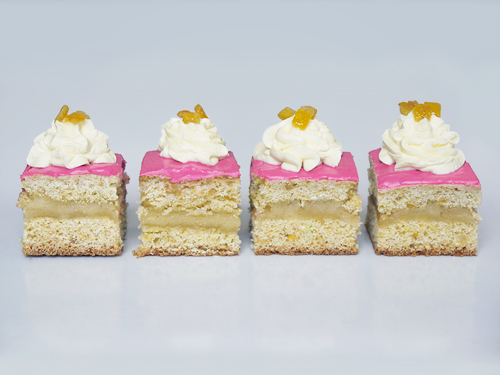 Why so many Dutch confections? Are you Dutch? Great oranjekoekjes!! Hi Magdalena – nope, not Dutch, but I like the food and got some personal links there. I usually post something each Queen’s Day, it’s a bit of a tradition now. Thanks, glad you like it. I’m going to be dusting off the poffertjes pan tomorrow for the “big day”. Hope you have a good one too. Thanks Alli. I wondered about the marzipan, and I actually rolled it out first “pure”. I got a little worried that it was too firm, so hence mixing it up with the orange juice. I think that worked a treat, as the filling was soft and sticky, rather than hard and dry. I’d recommend it! I actually like the bright pink, especially with the contrasting yellow of the peel. Looks very appetizing. I love seeing all this Northern European food coming out of your kitchen!